The people who make Scratch have migrated it to Flash. This is the most bonkers, hare-brained, backward idea they could have had. Migrating to a proprietary, platform-dependent, insecure, soon-to-be-extinct framework dooms Scratch to oblivion. Not to worry: we know of several excellent alternatives. If you’re even only vaguely interested in software for education, you’re sure to have come across Scratch. 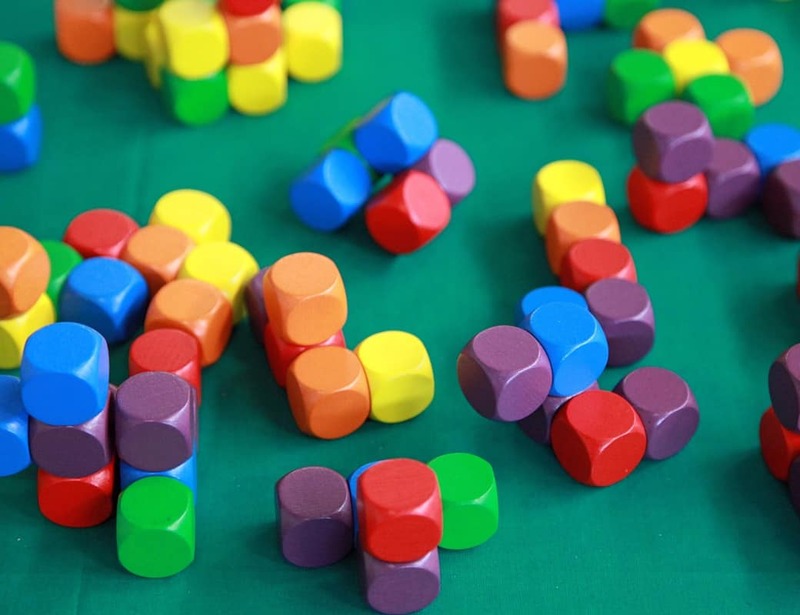 It’s the colourful programming language that allows kids to to assemble programs using lego-like blocks. Unfortunately the people in charge of the development have decided to migrate Scratch to Flash. Scratch was previously based on Squeak, an implementation of Smalltalk which is both free and open source. Flash, however is neither, so, oh sure, Scratch is still nominally “free”, but requires a proprietary and insecure framework in your browser to work. … Not like this. (What Scratch looks like today on a modern, flashless browser). Furthermore, to all practical effects, Scratch is not even cross-platform any more. Even if doesn’t run in your browser, in theory, you could also download and run an offline version of the editor. But again you need Flash, which means you need Adobe AIR, a runtime that hasn’t been supported on Linux since 2011! Nobody in their right mind should run proprietary software that has been rotting away for five years. The number of discovered vulnerabilities is going to be colossal, especially considering Adobe’s atrocious security track record. So, if you are using or considering using Scratch in your school or for your kids, forget it right now. But, don’t worry, this doesn’t mean you’re students should miss out, because we’ve got something, two somethings to be precise, which are better. Way better. The first one is Blockly. Blockly is not exactly a language, but it is more like an API. This means it is a set of tools that allows you to build your own customised language. If that scares you, don’t worry, although we’ll get into why that is awesome (not scary) in a minute, just know we’ll also be reviewing Snap! in our next chapter. Snap! is a vanilla Scratch-like language you can start using right away with your kids. But we’ll be talking about Blockly today. If you open multi_playground.html you can see the different layouts you can give your workspace. Copy that to an .html file and you’ll have a very basic page with a Blockly workspace. Very briefly: in the <head> section of the page, you drag in the Blockly API. In the <body> you define the size and location of the workspace, set up what block categories you want to include, and then execute the Blockly.inject() function at the bottom of your page (yes, it has to be at the bottom) to actually inject the Blockly workspace into the page. Remember to change all the instances of path/to in the code above to the real paths to your Blockly components. The most basic Blockly programming environment. 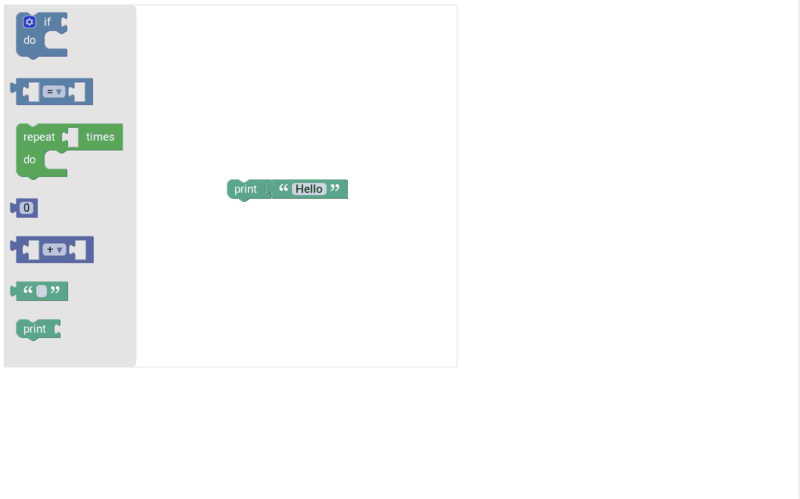 Although the above does show a basic Blockly instance working in a web page, you can’t do much with it. There’s no translation to an executable, text-based language, no run button, and no panel where you can see the effect of the blocks, i.e. there’s nothing like the “stage” in Scratch. However, there are more useful examples in file:///path/to/dir/blockly/demos/index.html you can try. 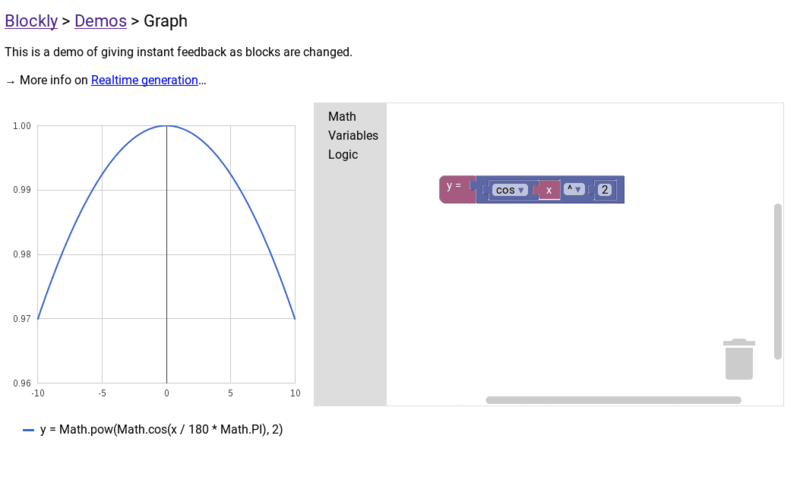 You can use blocks to generate graphs of mathematical functions. Build your own blocks with the Block Factory. Likewise, BlocklyPi allows you to read from and write to the GPIOs of a Raspberry Pi, the same way you would do with Scratch for the Pi. This allows you to control motors, read from sensors, and do all sort of cool things with the Pi. The above work by running the Blockly instance on a web server (i.e. you connect to the server running on your computer, you don’t directly load a page into the browser). Blockly translates the block programs into whatever language you need, and the underlying web server executes the code on your machine, for example, pushing the translated code to the Arduino itself. Let’s see how this works in practice. Take BlocklyDuino for example. BlocklyDuino works when you connecting to a Python web server that serves the front end to your web browser. It then uses tools from the Arduino IDE to compile and upload your programs. This means you have to have a working version of the Arduino IDE installed on the server computer. You can now use your web browser to connect to the server running on 127.0.0.1:8080. 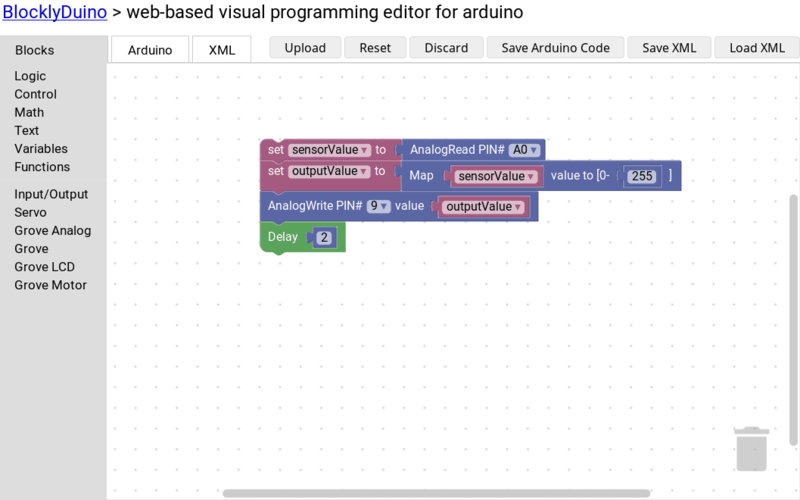 You can use BlocklyDuino to program an Arduino board connected to your computer. Below you can see a video of a program using blocks that reads in the value of a potentiometer and uses it to adjust the brightness of a LED. 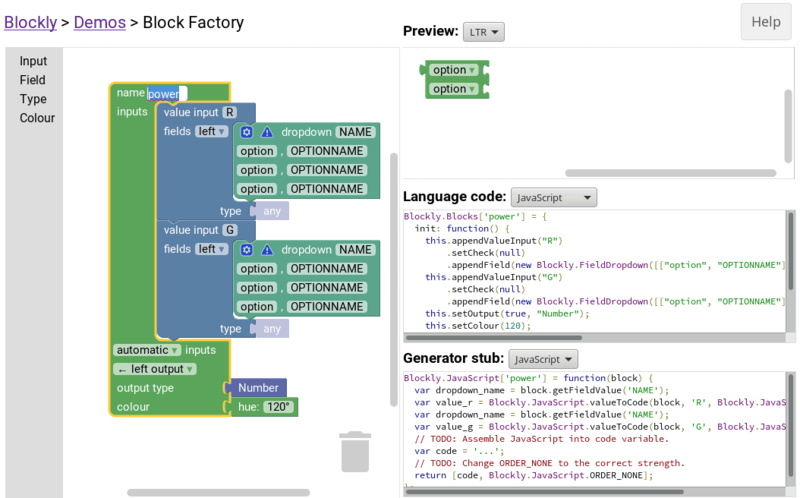 Blockly literally gives you the basic building blocks to create your own brick-based programming environment. However, it does require a certain know-how. If you are just looking for a drop in for Scratch, what you need is Snap!, a block programming environment we’ll be looking at next time. Cover image by Bernd Hildebrandt for Pixabay.com. Interesting, but only compatible with Chrome is not good enough, I’m afraid. It reminds me of the days of “Optimized for Internet Explorer”. No thanks. I like that you not only defined a serious problem but worked out a great solution (and another forthcoming). I see too many articles in all walks of life where we’re left with nothing but complaints (valid as they may be) but little in the way of options to deal with the situation. Nice job, great site! Thanks Doug. I’ll check it out for part 2. Do you knwo why the sidestep into Flash? I believe the reasons they had were things like speed and perhaps bugs with html5 audio, and html5 stuff not supported in safari on ios I’m guessing. Two months later, where is the snap part of the article ? About the comments: migrating to flash is bonkers, safety holes etc. They miss the objetive of Scratch don’t they: make it easy to write programs for super beginners. In a few hours with scratch I was able to find most basic concepts of programming in an ide like environment that kids could master. Does blockly just create nice representations or does it give the user the possibility to use all that ? And it has been there for nearly a month. For the other things, scratch has a lot of qualities in its two versions (one for above 8 y.o and one for older kids, adults and teens), and the great quality, in my opinion, is its social site, where you can share and discuss your work. There is plenty of sites like code.org, there is also code battle. But Scratch-like softwares are more creative. Some kids may prefer code.org-like to start, some may prefer Scratch-like. Like most things Google, this project exhibits an extreme prejudice toward and neglect of Microsoft development languages and platforms. You can almost bet that if a project or technology is associated with Google in some way, then cross platform = across the platforms they benefit from supporting and open = open to the extent it serves their corporate agenda. These are mere sad truths spoken by a guy old enough to remember when the terms open and cross platform had much more honorable intent.